Wheat is an excellent insulator of heat and provides an even heating and distribution of warmth to desired areas. Heat therapy has been proven to provide many therapeutic benefits such as: increased blood flow, relaxation of tendons and muscles, relief from stiffness and inflammation as well as a reduction in the sensation of pain. Wrap around wheat bags are a great option to ensure that your wheat bags stays in place and therefore heat can be applied to the desired area constantly and securely. The wheat bag can be secured to the lower back, shoulders or any joints in the body using the 45cm long Velcro straps attached to the bag. The fabric covers allow for direct application to the skin as well as providing a non irritating feel. 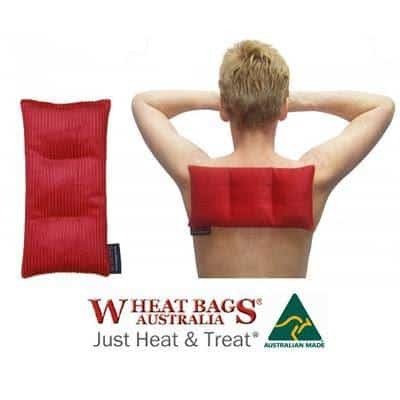 Wheat bags are available in a variety of shapes, sizes and colours and are available for purchase at any of Core Physio’s 11 Adelaide locations.